Shanghai, China (July 14, 2015) — Shanghai Disney Resort, the first Disney resort in Mainland China, will introduce magical Disney storytelling and experiences designed especially for Chinese guests when Shanghai Disneyland opens in Spring 2016. The theme park will feature six themed lands filled with world-class attractions and live entertainment spectaculars – many appearing for the first time in a Disney theme park. Disney Chairman and CEO Bob Iger today revealed details of the highly anticipated vacation destination during a presentation at Shanghai Expo Centre, unveiling a scale model of the resort and displays that showcase key highlights of attractions, entertainment, dining and hotels. 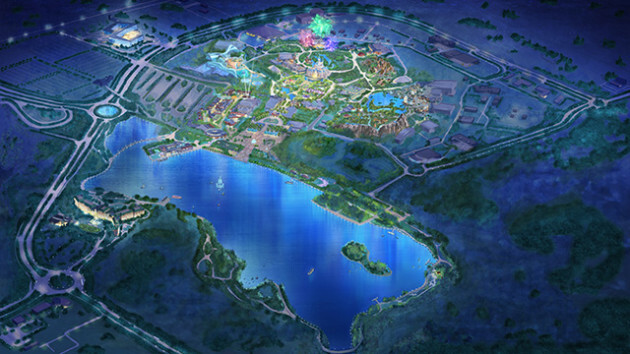 “We are building something truly special here in Shanghai that not only showcases the best of Disney’s storytelling but also celebrates and incorporates China’s incredibly rich heritage to create a one-of-a-kind destination that will delight and entertain the people of China for generations to come,” said Iger speaking to media during today’s presentation at the Shanghai Expo Centre. “We are taking everything we’ve learned from our six decades of exceeding expectations – along with our relentless innovation and famous creativity to create a truly magical place that is both authentically Disney and distinctly Chinese,” said Iger. Shanghai Disneyland, a theme park with six themed lands: Adventure Isle, Gardens of Imagination, Mickey Avenue, Tomorrowland, Treasure Cove and Fantasyland, with the Enchanted Storybook Castle. Shanghai Disneyland Hotel and Toy Story Hotel, imaginatively themed hotels conveniently located near the theme park. Wishing Star Park, with beautiful gardens, a walking path and a glittering lake. Shanghai Disney Resort promises something wonderful for everyone. Guests will be immersed in popular Disney stories that come to life at the largest castle in a Disney park, at the first pirate-themed land in a Disney park, on the longest Disney Parks parade route and in more enchanting places filled with thrills, creativity and adventure. Throughout the resort, visitors will encounter another distinguishing Disney difference: warm hospitality and renowned guest service delivered by Disney cast members. Shanghai Disneyland, the first theme park of its kind in Mainland China, will be a world of boundless possibilities and a place to create cherished memories that last a lifetime. Lush gardens, live stage productions and thrilling attractions will appeal to guests of all generations who visit its six lands. Guests also will encounter Disney characters in each land, including Mickey Mouse and his pals, Disney princesses, Captain Jack Sparrow and Winnie the Pooh. Mickey Avenue is the hometown of imagination, a welcoming, whimsical neighborhood filled with lively shops and restaurants. Stepping into this cheerful land sets the tone for a visit to Shanghai Disneyland, where guests will leave their worlds behind and enter lands of adventure, fantasy and the future. Located just inside the entrance to Shanghai Disneyland, Mickey Avenue is the first main entry at a Disney park that is home to Mickey Mouse and his pals, including Minnie Mouse, Donald and Daisy Duck, Goofy and Pluto. Guests will have the chance to learn more about Disney characters and their stories before entering the other themed lands. For example guests will discover the Italian family tree of Donald Duck, displayed on a mural at Il Paperino – a gelato shop on Mickey Avenue where Donald is the host. Guests will enjoy shopping and browsing in this bustling commercial center, filled with an extensive array of items created especially for the people of China. Avenue M Arcade will feature the largest selection of gifts and collectibles inside the theme park, with items exclusively designed for Shanghai Disney Resort. Guests will be able to choose a treasured keepsake to take home as a memory of their visit, or select gifts for friends and family. Four neighborhoods will make up this colorful avenue, where guests may share a hug and get a photo with some all-time favorite Disney characters. Celebration Square is the friendly heart of the community. Park Place lies just beyond the square, near the Gardens of Imagination. The Market District is on the outskirts of the avenue, across from the Theatre District, an artsy neighborhood. Each neighborhood engages visitors with the optimism of Disney. red-and-white polka dot dress. Guests will also find freshly handmade treats here, inspired by some of their favorite Disney characters. –Unique main entry: For the first time in a Disney park, the main entry to Shanghai Disneyland will be the hometown of Mickey Mouse and his pals. –First tribute to the original Mickey Mouse: The Steamboat “Mickey” fountain premieres at Shanghai Disneyland, in tribute to the 1928 animated film created by Walt Disney to introduce Mickey Mouse to the world. The fountain is a modern spin on the film, using a more current version of Mickey than Walt’s original. The fountain is at the park entrance, leading into Mickey Avenue. This land will contain seven individual gardens with themes of family, friendship and fun:Garden of the Twelve Friends, Melody Garden, Romance Garden, Woodland Garden, Garden of the Magic Feather, Fantasia Garden, and Storybook Castle Garden. Each garden will be filled with engaging activities, floral and woodland displays, and playful photo opportunities. –First Garden land: The first land inside a Disney park designed as a garden, the Gardens of Imagination is tailored to the Chinese people’s love of gardens. It includes a novel, terraced area for viewing castle stage shows and the nighttime spectacular. –Chinese Zodiac murals: For the fist time,Disney and DisneyPixar characters will be depicted as representatives of a Chinese zodiac animal, in beautiful mosaic murals. Guests will get to learn more about these Disney characters and their stories, at Garden of the Twelve Friends. –First Fantasia-inspired carousel: Guests will take a spin on Fantasia Carousel, the first carousel in a Disney park that features the music and mythical creatures from the classic Disney film, Fantasia. The Enchanted Storybook Castle will shine as the dramatic landmark of Shanghai Disneyland, the tallest structure in the theme park and also the tallest, largest and most interactive Disney castle in the world. Located at the heart of Shanghai Disneyland, the splendid castle will offer immersive attractions, an elegant table-service restaurant, a Bibbidi Bobbidi Boutique salon for children, shopping and spectacular entertainment. In another first for Shanghai Disneyland, this will be the first castle to represent all the Disney princesses. Enchanted Storybook Castle also is a showcase of technology and creativity, from the innovative application of Building Information Modeling (BIM), and Digital immersive Showroom (DISH) technology in its design, to the themed finishing touches. These advanced construction and design technologies are part of the commitment made by The Walt Disney Imagineering Shanghai team to work collaboratively with Chinese partners to utilize new techniques in building the Castle. DISH and BIM are computerized methods used in design stages and in advance of actual construction, enabling the work to be more efficient, with enhanced storytelling. When night falls on another magical day at Shanghai Disneyland, guests will gather outside to enjoy the fantastic nighttime spectacular. The show will paint the sky above Enchanted Storybook Castle in dazzling light, with music, special effects and fireworks, adding a special “kiss good night” for all the guests at Shanghai Disney Resort. –First Disney castle to present all Disney princesses: Enchanted Storybook Castle is the first castle in a Disney park to represent all the princesses from Disney’s rich and timeless heritage. Guests will be able to greet the princesses and take photos at Storybook Court. A crown to symbolize all the Disney princesses will be installed on the largest golden finial atop the castle. –Interactive scenes with Snow White: At the top of the castle a “Once Upon a Time Adventure” offers guests an unparalleled experience that is created especially for Shanghai Disneyland. For the first time in a Disney park, guests will interact with an animated version of Snow White as they stroll through scenes of her story. –Maiden voyage: Voyage to the Crystal Grotto, an enchanting new excursion, is the first attraction to take guests underneath a Disney castle. Traveling beneath the Enchanted Storybook Castle, guests will discoveran original story and a magical world. –Inverted-coaster ride system: The flying sensation in Peter Pan’s Flight will be enhanced by a newly developed inverted-coaster ride system, debuting at a Disney park for this attraction. With new magic, the ride vehicles swoop closer to the action with varying speeds, enabling guests to become more immersed in the story as they fly in and out of each scene. –First Adventure Isle at a Disney theme park: Created from the ground up with a fresh story and original characters, this new land was specially designed for Shanghai Disneyland. For the first time at a Disney park, guests will discover Roaring Mountain, encounter the mysterious being Q’aráq, and blaze their own trails at Camp Discovery with a series of challenges, adventures and expeditions for everyone in the family. –Untold story of an ancient civilization: Guests at Shanghai Disneyland will be the first to enjoy the story of the ancient Arbori people, complete with the unique décor, original music and legends of this newly discovered tribe. Honoring the Arbori admiration for nature, the attractions will feature water, land and sky. Guests who venture into Treasure Cove will discover the first pirate-themed land at a Disney park. Created especially for Shanghai Disneyland, it’s home to a wild, colorful crew of scoundrels, always on the hunt for fun, action, adventure and danger. Rich in detail and storytelling, Treasure Cove is a raucous collision of color, sights and songs, blending cultures and countries with pirate frivolity, mayhem and personality. The story of Treasure Cove dates back to the 17th century, when piracy was a thriving enterprise in the Caribbean. In Disney lore, this Age of Piracy featured a band of seafaring rogues who chased legendary treasures, fought monsters and battled each other, always with a humorous glint in their eyes. Guests will be immersed in a pirate’s life as soon as they arrive at the entry, the first of five neighborhoods at Treasure Cove. From there, they will explore Shipwreck Shore, Fort Snobbish, Landlubber Landing and the Village, each with its own charm and personality. The land features a mix of architectural styles, along with two giant ships, pirate-themed restaurants and a fun, water play area. Guests of all ages will enjoy the epic scenes in Pirates of the Caribbean – Battle for the Sunken Treasure, as well as the up-close action and acrobatics of the stunt show at El Teatro Fandango. –First Pirate-themed land at a Disney park: Treasure Cove brings the first pirate-themed land in a Disney park to Shanghai Disneyland. With authentic re-creations of a pirate world and state-of-the art attractions, Treasure Cove will present the raucous life of a pirate with drama, humor and extraordinary detail. –New, highly controlled ride system: Along with the grand scale of storytelling in Pirates of the Caribbean – Battle for the Sunken Treasure, guests will enjoy the benefits of a sophisticated, highly controlled boat system, premiering in Shanghai. The boats are able to spin, move and react smartly to their position, triggering action and synchronized music as they travel through breathtaking scenes and lively battles. –Debut for pirate stunt show: “Eye of the Storm: Captain Jack’s Stunt Spectacular” will make its global premiere at Shanghai Disneyland. The elaborate, exciting stage production features sword fighting, stunning visual effects and a whirlwind finale. The new Tomorrowland, created especially for Shanghai Disneyland,will be a venue of limitless possibilities. With imaginative design, cutting–edge materials and programmable spaces, it blends the best of mankind, nature and technology. Tomorrowland celebrates the hope, optimism and potential of the future – themes from the original Disneyland – now for a whole new culture and the next generations. Disney’s innovative use of technology has produced a fresh land where guests will go to infinity and beyond on Buzz Lightyear Planet Rescue, a new target-shooting adventure; break the bonds of gravity on Jet Packs; and step into the worlds of the Star Wars galaxy and Marvel universe. With the world premiere of TRON Lightcycle Power Run, guests will board two-wheeled Lightcycles for one of the most thrilling adventures at any Disney park. It’s a coaster-style attraction with high-speeds, an indoor-outdoor track and rich storytelling. Guests of all ages, especially teens and young adults, will enjoy the atmosphere in Tomorrowland. On the lower level, a creative stage serves as a play space for bands, DJs, artists and dancers. A winding ramp to the upper concourse will take guests to Tron Plaza and the Stargazer Grill restaurant, which has spectacular views of Shanghai Disney Resort as well as the stage below. –First TRON Lightcyle Power Run attraction and innovative canopy: TRON Lightcycle Power Run makes its global premiere at Shanghai Disneyland. For the first time at a Disney park, guests will board Lightcycles, two-wheeled vehicles that take them inside and out on a coaster-like attraction with high speeds and rich storytelling. The attraction’s canopy is made of a lightweight, reflective material with special color-shifting edges, enhancing the guest experience. –New target system and Space Cruisers: On Buzz Lightyear Planet Rescue,guests will engage an innovative target system with real-time feedback and more than 100 targets, the most in any Buzz Lightyear attraction worldwide. The attraction also premieres a story line created for Shanghai Disneyland, with Buzz as a Space Ranger who recruits guests to board new vehicles – Space Cruisers – to help him fight the Evil Emperor Zurg. The tenants will include well-known local and international brands including renowned restaurants Shanghai Min, Crystal Jade, and The Cheesecake Factory operated by Hong Kong Maxim’s Group, as well as various retail options including stores under I.T group, i.t and BAPE STORE, and a LEGO brand store. Other exciting high-profile brands including Food Republic, Coconut Paradise, The Dining Room, Hatsune, blue frog, Xin Wang Restaurant, BreadTalk, Toast Box, and Chow Tai Fook will also be the first of several dozen tenants to offer world-class shopping and dining options. In the marketplace specialty shops adjacent to World of Disney, Dstreet will offer urban trends along with Dtech, the rapid printing technology that allows guests to create personalized electronic accessories on demand, with artwork of their choice. Also, located in the marketplace will be TrenD, a stylish boutique for “fashionistas” in search of clothes with a Disney character. The trendy apparel is set within an eclectic environment with a city vibe. This district will have a distinct personality — eclectic and exotic. Its narrow cobblestone streets and small courtyards will remind guests of a bygone era, and the international array of foods will reflect the story of many different cultures and people coming together. A variety of Asian cuisine is part of the mix. The open kitchens and al fresco dining areas will provide a sense of warmth and welcome, encouraging conversation and camaraderie. Spice Alley is a great place to meet for lunch or after work, and the evening strikes a more romantic mood, with twinkling lights and music. –THE LION KING in Mandarin: The Walt Disney Grand Theatre, an impressive new entertainment venue, will present THE LION KING, making its global premiere in Mandarin. –Unique Mickey Mouse sculptures in Liuli glass: Seven unique Mickey Mouse figures will be sculpted for the first time in Liuli glass, created especially for Disneytown, and created by Chinese artists, they will range in height from 1m to 1.2m. The colors will represent the five Chinese elements (gold, wood, water, fire, and earth), as well as the dragon and phoenix, which represent harmony in Chinese culture. Two hotels with imaginative Disney themes will invite guests to extend their stay at Shanghai Disney Resort, offering friends and family a chance to create a multi-day experience with more time to discover all the fun and enchantment at Shanghai Disneyland and Disneytown, including the Walt Disney Grand Theatre. Keeping the Disney magic alive from day into night, the Shanghai Disneyland Hotel and Toy Story Hotel are conveniently located next to Shanghai Disneyland. Richly themed in Disney storytelling, with warm and welcoming service, the 420-room Shanghai Disneyland Hotel and the 800-room Toy Story Hotel will offer a range of entertainment, dining, shopping and other recreation options, providing Disney’s world class experiences with Chinese culture in mind. Shanghai Disneyland Hotel is an elegant Art Nouveau-inspired hotel with a touch of Disney magic and imagination. Offering a more playful experience, Toy Story Hotel transports guests into a toy-filled world inspired by the Disney•Pixar series of Toy Story animated films. Whichever hotel the guests choose, they will be immersed in Disney stories and create lasting memories with beloved family and friends. Located across the lake from the theme park, the Shanghai Disneyland Hotel is the resort’s signature hotel. It features a full range of amenities, including themed dining experiences, a gift shop, a fitness center and an indoor swimming pool, as well as banquet and meeting facilities and a wedding pavilion. The hotel’s architecture, characterized by vibrant shapes with dynamic and undulating lines, was inspired by the Art Nouveau movement. The Art Nouveau theme appears in the hotel’s architecture, graphics, wall and window coverings and even furniture – all accented with an overlay of Disney wonder. Disney storytelling begins as guests arrive in the porte cochere, where bronze statues of Mickey and Minnie in formal attire welcome guests to the hotel. Throughout the seven-hectare hotel property, guests will find statues of characters from Disney animated classics such as The Little Mermaid, Beauty and the Beast, Cinderella and The Lion King. One of the special Chinese features at Shanghai Disneyland Hotel will be a fountain with a large, unique centerpiece — a glass peony blossom with classic Disney fairies. The peony is the flower of China and this piece, produced in Shanghai, will be one of the largest sculpted, solid glass flowers in all of China. Special touches include amenities that cater to Asian customs, such as slippers and high-quality tea bags, and carpets with floral designs and patterns easily recognized by Chinese guests. Special features include King Triton Pool, featuring characters and motifs from The Little Mermaid; Hakuna Matata Oasis, a jungle-themed water play area inspired by The Lion King, and the Cinderella Ballroom, designed specifically for weddings. Delicious, Disney-themed items will be on the menu at four dining locations. Guests may dine with Disney Characters at the buffet-style Lumiere’s Kitchen, or enjoy a fine dining experience with breathtaking views of Shanghai Disney Resort at the Aurora restaurant. The Bacchus Lounge and Ballet Café, both inspired by the Disney animated classic Fantasia, will offer bar service and quick-service meals, respectively. The theme of the Toy Story Hotel is inspired by the Disney•Pixar series of Toy Story animated films. In addition, the design of the hotel’s figure eight “infinity” layout draws strongly upon Chinese symbolism and myth. In China, the number eight is considered to be very lucky, and clouds represent the coming of good fortune. The open-air Woody Courtyard features a larger-than-life Woody aboard his trusty horse Bullseye, and an oversized Buzz Lightyear greets guests in the Buzz Lightyear Courtyard. The hotel also features a counter-service restaurant, a water-play area featuring the Toy rocket and the Aliens, and a gift shop inspired by Lotso, the hug-loving bear character from Toy Story 3. For dining, guests will enjoy the Sunnyside Café, named for the pre-school in Toy Story 3. The Sunnyside Café offers tasty meals and a special Chinese touch in the décor. Floating above the guests will be Chinese-style kites, featuring Toy Story characters. The kites are inspired by traditional kite craftsmanship from Weifang in Shandong Province, the famous kite city in China. Guests will be entertained throughout their stay, even in the elevators. In the Woody Wing, they will hear Woody and Jessie providing greetings on each floor. Buzz Lightyear and the Aliens do the same in the Buzz Lightyear Wing. In line with the world-class standards of Disney hotels, the Shanghai Disney Resort hotels show great consideration for every guest with premier hospitality, cordial services and meticulous attention to detail. Benefitting from the proximity to Shanghai Disneyland and Wishing Star Lake, both hotels offer special logistical services to assist guests. –Merchandise package pickup: Merchandise purchased in the theme park can be delivered right to a guest’s hotel, at no extra charge. –Luggage service: Guests may drop off luggage at the main entrance of the theme park or at the hotels, to be held for their arrival. –Disney Resort Shuttle: Complimentary shuttle service will be available between Toy Story Hotel and Shanghai Disneyland, and between Shanghai Disneyland Hotel and Shanghai Disneyland. –Wishing Star Ferry: Complimentary water taxi service will be available between Shanghai Disneyland Hotel and Shanghai Disneyland. After enjoying some time at Shanghai Disney Resort, parents may bring their children to the Family Activity Centers, located at each hotel and filled with educationally inspired activities, crafts, games and story readings, all within a unique Disney and Disney•Pixar experience. Shanghai Disneyland Hotel and Toy Story Hotel will welcome people from all over the world to experience the best of Disney in Mainland China. A stay at the themed hotels creates an integrated, exciting and holistic tour of Shanghai Disney Resort, with hospitality that only Disney can provide. Disney’s world-class entertainment will bring a distinctive dimension to Shanghai Disney Resort, with a variety of live performances, character programs, a parade, a nighttime spectacular, a Broadway musical and more. Along with all the exciting attractions in Shanghai Disneyland, entertainment throughout the park will be included as part of the experience. Lively and talented performers – from Chinese acrobats to dancers and DJs – will make the entertainment one more reason to visit Shanghai Disney Resort for multiple days. “Eye of the Storm: Captain Jack’s Stunt Spectacular” at Treasure Cove: At El Teatro Fandango, the theatre audience will be enthralled as Captain Jack Sparrow and his band of wily pirates romp through the theatre in search of a misplaced treasure chest. As Captain Jack is confronted first by the beautiful redheaded star and then the Royal Admiral and his men, the swashbuckling action takes off with swordfights, fantastic stunts and a raging storm. Making its global premiere at Shanghai Disneyland, the show presents pirate humor and a remarkable finale as Captain Jack fights off the Admiral in a whirlwind adventure. “Tarzan: Call of the Jungle” at Adventure Isle: At the Storyhouse Stage, “Tarzan: Call of the Jungle” will present a powerful theatrical re-telling of the classic Edgar Rice Burrough’s story about a boy who is raised by apes and finally becomes the King of the Jungle. This musical will feature the iconic score, by Phil Collins, from the animated Disney feature film Tarzan, as it fuses immersive theatricality and Chinese acrobatics with an imaginative spirit. Enchanted Storybook Castle is the heart of Shanghai Disneyland, a happy home for dreams of romance, joy, adventure, and happily ever after. A daytime show on the castle stage will present spectacular moments from the stories of each of these Disney princesses — Snow White, Anna and Elsa, Jasmine, Ariel and Merida. This spectacular performance will celebrate the magic of Disney through its classic characters and songs, conveying the heartfelt belief that dreams really do come true. “Frozen: A Sing-Along Celebration” at Fantasyland: Audiences at Evergreen Playhouse will join their Frozen friends and the villagers of Arendelle for a fun and frosty interactive showcase, packed with a ﬂurry of stories, songs and sing-alongs.Two Arendellian Festival Guides will host the festivities and introduce each magical musical number. Well-known characters Elsa, Anna and Kristoff will join the fun and guests of all ages will be encouraged to sing along with a few favorite Frozen tunes. “Ignite the Dream: A Nighttime Spectacular of Magic and Light” – The Enchanted Storybook Castle will become the star of the nighttime spectacular as it inspires everyone to unlock and ignite their dreams. Mickey Mouse will be the guide for the show. As he discovers portals to new adventures inside the castle, worlds of wonder will come to life with stunning projections, lasers, fountains, inflatables and pyrotechnic effects. When “painted” on, around and above the largest Disney castle in the world, the effects will transform the castle into an amazing new world, a mesmerizing experience that will inspire imagination and awaken the dreamer inside of everyone. “Mickey’s Storybook Express” daytime parade: An imaginative parade, “Mickey’s Storybook Express” will transport fantasy, romance, music and merriment throughout Shanghai Disneyland each day. Traveling along the longest parade route in a Disney park, the parade will be led by a whimsical locomotive. A line of themed “train cars” will follow, each with its own exciting musical soundtrack and colorful cast of performers. Each train car will feature the characters, story and music of a favorite Disney film. With magical surprises and joyful energy, “Mickey’s Storybook Express” will create memorable experiences for guests of all ages. Shanghai Disneyland Band: Playing along Mickey Avenue, the zany musicians of the Shanghai Disneyland Band will bring a fun and silly underscore to Mickey’s happy neighborhood. The band will perform with traditional marching band instruments and also deliver an array of surprising sounds with merrymakers such as whistles, kazoos and Chinese instruments. Disney’s THE LION KING: The Disney landmark musical event THE LION KING will come to Disneytown for its global premiere in Mandarin. Since its Broadway premiere in 1997, 22 global productions have been seen by more than 80 million people, earning more than 70 major arts awards, including the Tony Award for Best Musical. THE LION KING will be performed at the 1,200-seat Walt Disney Grand Theatre, which is outside the gates of Shanghai Disneyland. It requires a separate ticket. In addition to the ongoing shows guests will enjoy throughout their visits, they also will have many opportunities to meet Disney characters and enjoy the street performers at Shanghai Disneyland. Tomorrowland will present Star Wars Launch Bay and Marvel Universe, exciting, interactive experiences created especially for Shanghai Disneyland. In a celebration of the Star Wars Galaxy, guests will meet heroes and villains of the saga, visit iconic intergalactic set-pieces, view props and memorabilia from the most recent episode, and be immersed in the Skywalker story through a state-of-the-art cinematic experience. In Marvel Universe, near the entry to Tomorrowland, guests will attend a multimedia mission briefing on the thrilling world of Marvel, meet some popular Marvel heroes and learn to draw some of their favorite characters. At Gardens of Imagination, families and friends may join Donald Duck and Chip ’n’ Dale to practice balance and harmony in the fun-filled Tai Chi with Character, an interactive character experience in Melody Garden. At Adventure Isle, guests will hear the enticing tribal rhythms of fantasy and nature streaming from Stone of the Sun & Moon,where the native Arbori musicians play some unexpected instruments. They may also meet characters from The Lion King and The Jungle Book, who gather at the tribal lodge’s Happy Circle to create memories exclusive to this land. At Treasure Cove, the frivolity, mayhem and personality of pirates come to life in a hilarious game, A Pirate’s Life for You! Guests will compete to become a pirate captain’s “First Mate.” They may also take photos and share pirate secrets with Captain Jack Sparrow. In Storybook Court at the Enchanted Storybook Castle, Disney princesses will pose for photos and hold court with guests. In the Royal Banquet Hall, where everyone is treated like royalty, guests may make a reservation to enjoy a plated meal and engage in in tableside interactions with Disney characters. In Fantasyland, guests will be able to hug Winnie the Pooh and watch out for the villainous Captain Hook, or they may enjoy music and stories of love and friendship. The Traveling Troubadours is a family of traveling musicians who will blend Western and Eastern instruments to present Disney music with lots of interaction and special moments. Another troupe of players will tell the beloved story of Beauty and the Beast with puppetry, humor and songs for Bai Ling Storytime. And once a day in Fantasy Festival, guests will be invited to approach the day with wonder and joy in a special dance with Disney characters.